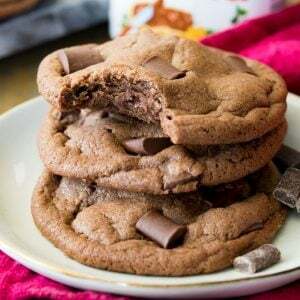 Soft and chewy Nutella Cookies loaded with Nutella and chock-full of chocolate chunk pieces. These are easy to make cookies (though they do require some chilling and therefore patience!) and their super soft and chewy texture almost melts in your mouth! I know that Mondays are never really fun anyway, but starting this one off by shattering the screen of my iPhone into a hundred little pieces has really put a damper on the beginning of this workweek. I reached for a Nutella Cookie to drown my sorrows with some chocolate/hazelnut (naturally), only to realize I’d just polished off the last of them last night, so that’s two strikes on my Monday morning. Here’s hoping that the day/week only gets better from here! 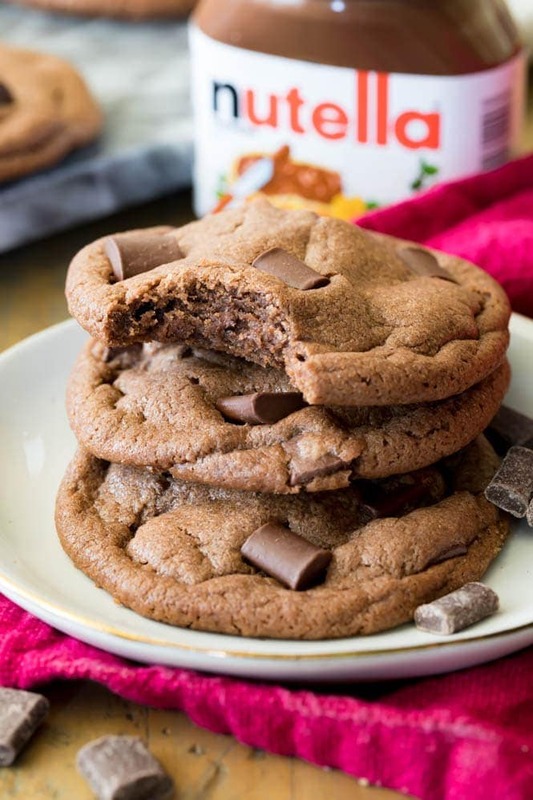 I think a fresh batch of Nutella Cookies are in order, and maybe you could use them for your Monday morning, too? These Nutella cookies are slightly modified from my best peanut butter cookies. Like those cookies, these are also super soft and buttery and crafted so that the Nutella flavor is predominant. Adding chocolate chips or chunks is optional, but I definitely recommend tossing a handful into the batter for some melty pops of chocolate in each bite. 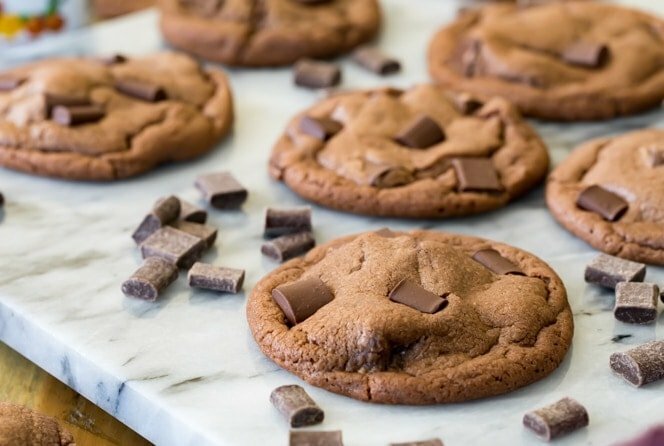 With this addition, these Nutella cookies remind me a lot of my double chocolate chip cookies, only with that distinct Nutella/hazelnut flavor (instead of just chocolate). The biggest drawback for this recipe is that chilling is required, and for at least 3 hours. I tried chilling the cookies for less time but found that they simply spread too much, and especially now with the weather warming up they’re even more likely to spread all over your cookie sheet if not chilled appropriately. You can prepare the dough the day before you plan to bake them if you prefer, just make sure to tightly wrap your bowl of dough with cling wrap before refrigerating so that it doesn’t dry out. 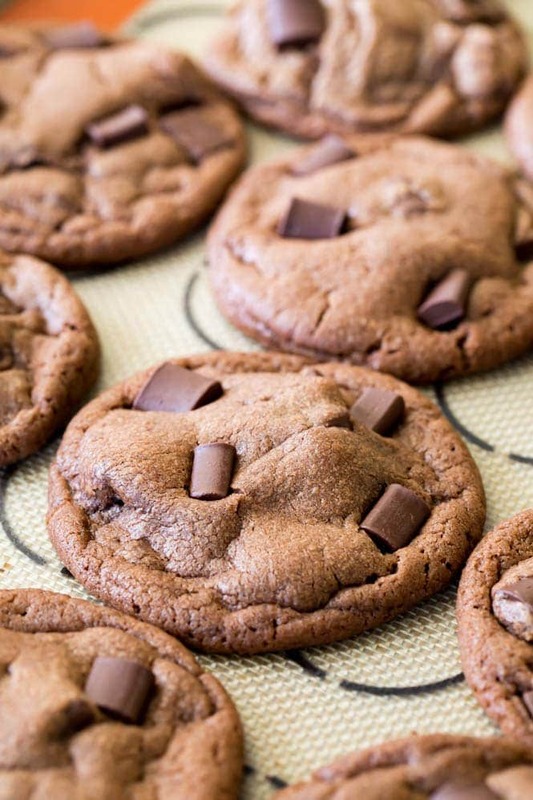 Soft and chewy Nutella cookies loaded with Nutella and semisweet chocolate chip chunks. Combine softened butter, sugars, and Nutella in the bowl of a stand mixer (or in a large bowl, using electric mixer) and beat until ingredients are combined and well-creamed. Add egg and vanilla extract and stir until well-combined. Cover bowl with cling wrap and chill for at least 3 hours. Once dough has finished chilling, preheat oven to 375F (190C) and line cookie sheets with parchment paper. Remove from refrigerator and roll into approximately 2-Tablespoon-sized balls. Roll dough into balls and place on prepared cookie sheet at least 2" apart. Bake on 375F (190C) for 10-13 minutes, remove from oven and allow to cool completely on cookie sheet. Enjoy! BEST COOKIES I’VE EVER MADE!!! I’ve baked these i think 8 or 9 times. It wasn’t over complicated at ALL! It was perfect for me since I’m only a pre-teen, but they looked, smelled, and tasted amazing and professional! Or at least I think so…I’m not sure because I think anything with nutella tastes good. But 5 stars for sure! My brother makes them for his cub scout meetings and I make them for ski trips. By far the best. Thanks for sharing!!! So my cookies turned out a looking wrong and at first i thought : oh no, I must have done something wrong. But then I tried it and I almost gasped. These cookies are Delicious! The edge had that perfect cookie crisp and the inside was, wow. I made these cookies the other day. Warning – they are highly addicting. I did add a bit more Nutella and used white chocolate chips. They were quit good, but maybe not “hazel nutty” as one expects with Nutella. I love the crispy outside and the chewey inside. Thanks for the recipie! Currently making these cookies and my house smells amazing!! Can’t wait to try them. I have made the recipe twice so far. The second time I made a few changes to change the flavor. I used a 50-50 blend of dark and light brown sugar. I also used a 50-50 blend os semi sweet and white chocolate chips. Finally I added 1/3 cup of heath pieces. I like both recipes but found the one I adjusted more to my liking. Can i make it in a smaller size? Yes, you will just need to cook for less time. FABULOUS! I made these cookies with my daughter and her friend yesterday — great playdate activity (with frozen nutella dollops and browned butter prepared before hand) and wow did we make all the neighbors happy with these amazing cookies. Home run! I love Nutella, so IMHO, best cookies I ever made. (I think I burned my browned butter but I strained out the small brown bits and turned out scrumptious).Thank you, thank you! Can’t believe this recipe isn’t pinned all over the internet. I made these the other day. The only problem I had is that they turned out crispy and not chewy. Don’t get me wrong, they are still delicious, my husband has already eaten half of them and my grandsons love them too. What did I do wrong to make them crispy and not chewy? Hmm, I’ve found that using parchment paper or silpat helps keep the bottoms of my cookies from becoming too crisp but if you did use one of those, other factors could be your oven temperature, it may be running higher than it is indicating to you (I keep two thermometers inside my oven because I don’t trust my digital indicator). 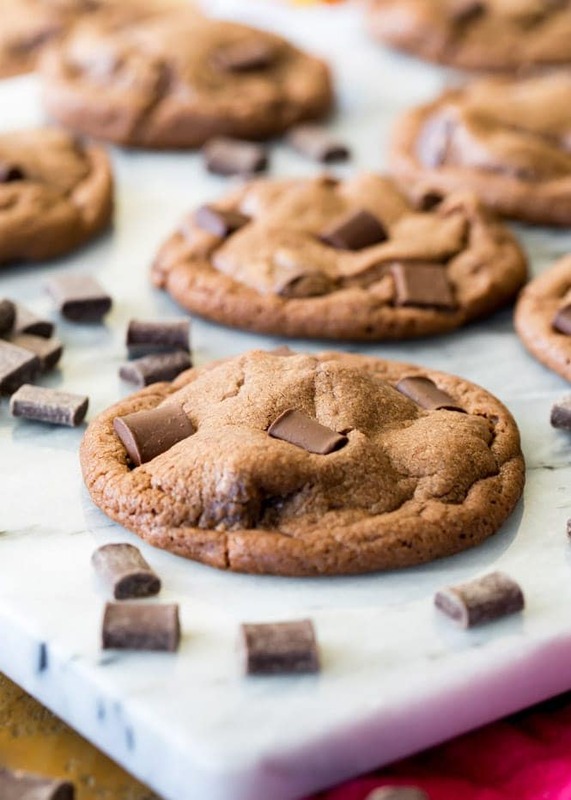 You could also bake them a bit less time, I usually pull my cookies out when they still seem just slightly underbaked in the center and allow them to cool completely on the baking sheet, this also helps to keep them nice and soft. I hope that helps but am glad to hear you enjoyed them otherwise! Let me know if there’s anything else I might be able to help troubleshoot! Thanks so much. I will try your suggestions the next time I make these. Which will probably be very soon. But I’ll have to try out this variant some time. I also have to put together another update with the recipe feedback, especially the strawberry shortcakes (although I’m not entirely happy with how those turned out yet).